We've worked with STABILO a few times before and today they return with an end-of-Summer giveaway. 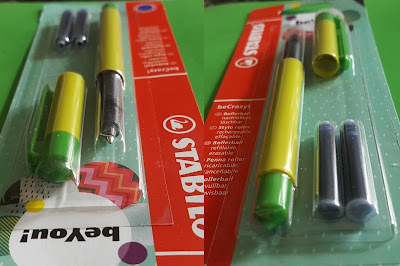 A firm favourite with most of my family, when we were asked if there was anything in particular we'd like to review and give away, STABILO pointMax Fineliners were top of the list. 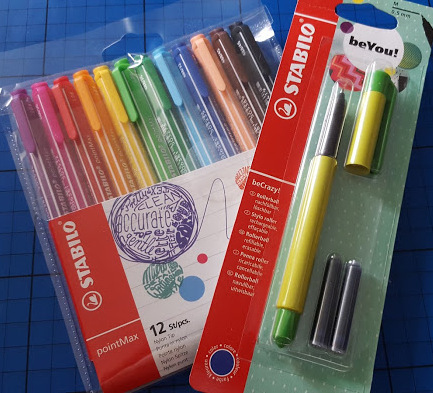 STABILO sent us a pack of 12 fineliners and also included one of their new beYou! rollerball pens, and one of my readers can win this handy bundle for themselves. STABILO pointMax nylon tipped fineliners are a real classic. 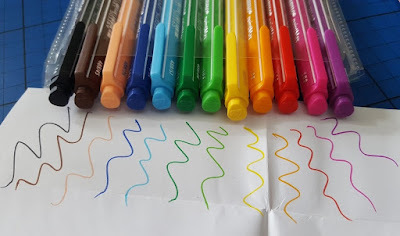 Gaining their name from the size of the tip - 0.8mm or M, fine enough to write notes with - they are reliable and the ink is bright with intense colour. In a selection of different pack sizes with up to 24 different colours available, these are too good for little children, perfect for more complex and fine work. Just in case you forget, or someone else borrows them and isn't careful, the cap can be left off for up to 24 hours before the tip and ink become damaged and dry out. There are a choice of thin and thick grip pens, all with a large softer touch grip zone which feels nice in your hand (works for left or right handed). beYou! rollerball pens are refillable with standard ink cartridges, 2 of which are included, so this should be a pen you can hang on to and use for some time to come. 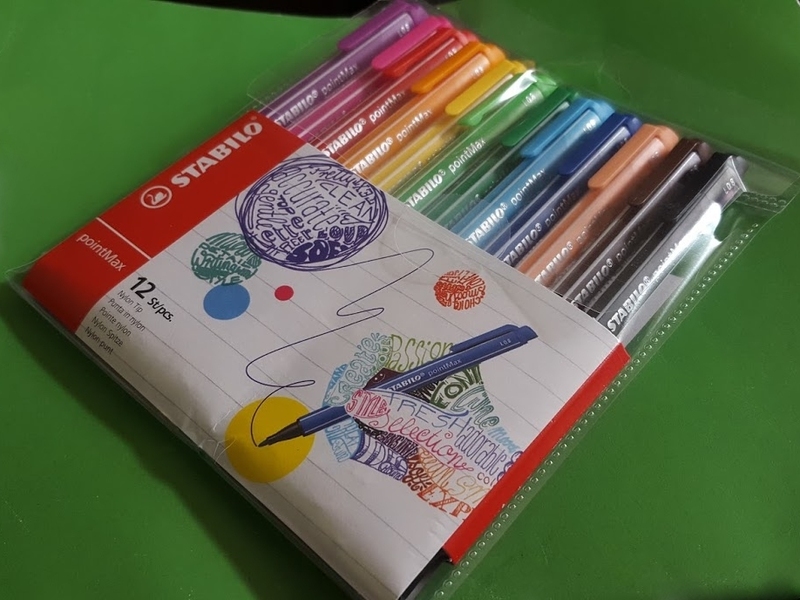 STABILO products are available in a multitude of places including stationers and supermarkets, corner shops and online, including Amazon. STABILO pointMax pack of 12 rrp £11.99, STABILO beYou! rrp £5.99 each. STABILO have offered one of my readers their own pack of pointMax fineliner pens and a beYou! rollerball as a giveaway prize. Entry to the giveaway is by Gleam form below and it is open to UK entrants only. The giveaway will end at midnight Sunday 17th September. Full terms and conditions are at the bottom of the Gleam form. We were sent our pointMax fineliners and beYou! 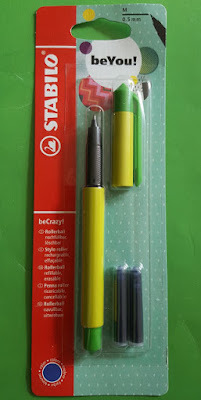 rollerball pen for review. We drew pictures and played games on paper on holiday last week! I've started trying to Bullet Journal so last used a pen to write on paper this morning. I love opening a new pack of pens, the colours are so clear and bright, just makes you want to draw something. I write all the time, don't know about drawing though, I'm not much of an artist! I'm always making a to do list, memory's not quite as good as it was! I tend to write lists for shopping, and a To Do List. Fiancé stated he likes lists :- I think he feels he has achieved something as he ticks each item of the list. Also we both started a journal a few months ag :- It was as part of a college course called High Five. We record what we appreciated each day, Acts of Kindness, Etc. I also like to colour in, do an odd drawing / doodle now and again. I draw dinosaurs for my son every day!!! I wrote a shopping list this morning. Today, I drew some pictures with my children! i have to do it quite regularly with work, writing that is. Today. I've archiving documents at work, and all of the paperwork involved is handwritten. I've actually got through 2 biros in the last month! I write daily at work to fill job cards & often draw (very badly) small diagrams to explain details. My handwriting is poor so often I use capitals to make it more legible. I send postcards to my mam every week. I sent a thank you card to an older relative recently who doesn't use computers. Today! I wrote a little note for myself to remind me of something I have to next week. Draw some emoji with my daughter today. I drew a sketch of my favourite view last week, to maybe use as a wedding save the date card. Yesterday, though it wasn't much of a writing exercise!! Today. I'm always writing things to do notes. That would be this morning when I left a note for my bf to pick up some medication for the cat. I wrote on paper just today! Last night when I had to fill in a form. Yesterday when I wrote a shopping list. Thanks for this lovely giveaway. A note for the post man! I'm always writing lists, to do lists, shopping lists etc. a busy day tomorrow so i wrote a to do list this morning! I had to fill out a form by hand the other day and it made me realise how little I use a pen, my hand was aching for hours after!! My son loves drawing (I am not so gifted), he's only 10 but he has definitely got the art bug, he has just used his pocket money to spend over £50 on Copic pens which are supposed to be excellent for fine drawing, he would love this prize. I wrote a shopping list earlier, if that counts? I hand wrote a note card for a friend . 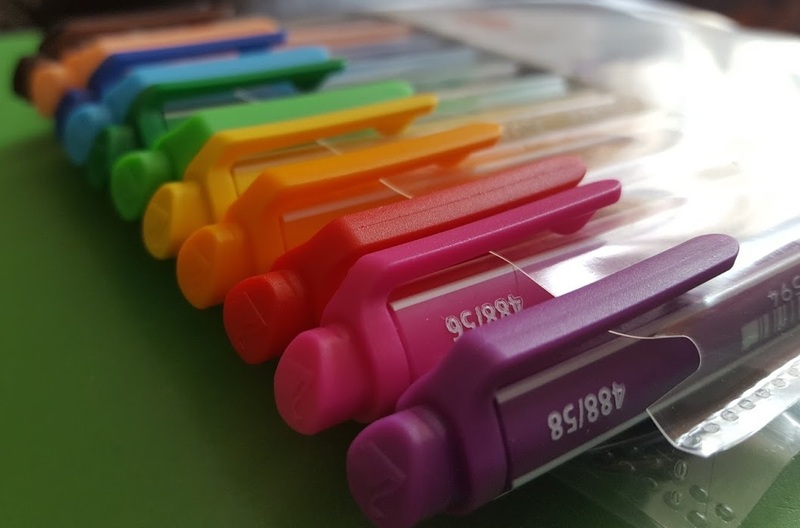 Love these fineliners for colouring tiny weeny details as well as writing! we did sticking and glueing last night while watching xfactor! I'm always writing to do lists! Today in my uni notebook. Plus lists for everything. As a papercrafter, I write and draw every single day. And I have just written a letter to a friend, about half an hour ago. It's still lovely to get things in the post! I wrote a couple of reminder notes for myself on postits yesterday. I wrote a shopping list today. I wrote on paper today lots of various stuff from lists to a letter. Two days ago - I was colouring in an adult colouring book! A couple of days ago, when my daughter wanted me to draw her a house. I post it note everywhere, so last night was the last time. this morning -I wrote a letter ! I write in my diary everyday. Yesterday I drew some flowers and funny faces with my daughter as she loves drawing together with me! I keep a notebook next to my computer, and I'm always making notes. Just now, planning a birthday party for my little lady so I need to stay organised and make sure I write everything down! I write on paper everyday. I always have a shopping list on the go. I drew in my sketchbook about 25 minutes ago. My Sketchbook goes everywhere with me. today I did my paperwork at work. Not very exciting! I wrote down a reminder to order from the chemist this morning. My daughter is a self direct artist. She is only twelve and is doing brilliantly. She is always asking for special pens, This would do her well. She is also home educated. Today. I work in a nursery, so it's pretty constant. does adult colouring books count?! I was out with the kids chalking on the slabs earlier on today. Helping my son with his homework this morning. I doodle all the time usually hedgehogs? but I haven't drawn a picture for ages! I am always writing or drawing! I have a book of lists - where everything I need to do gets jotted down, I write in my diary everyday, and I write notes to my husband when we work totally opposite hours to each other, which means some weeks we hardly see each other! I drew a man with my daughter she is much better at art than me. I work in a primary school so I write and draw on paper all the time. Yesterday, I wrote a shopping list. Yesterday, filling in my appointment diary for the week! I wrote a letter to my mum who lives in Australia last week. I write everyday - lists etc, but these look perfect for crafts too! Wrote the shopping list on Friday. Always writing stuff but that's work-related as receptionist/admin assistant. But love colouring in and drawing stuff for my great-niece to colour in too. Plus a few friends still like hand-written letters instead of email. I write shopping lists most days , prefer paper to using apps etc. I have recently framed over 30 photographs to make a gallery wall going up our stairs. to keep costs down I used frames purchased from charity shops, so to make them look nicer I decided to draw a line round the hole in each mat in gold pen. Suffice to say that I am never going to try that again, drawing a rectangle with right angled corners was a nightmare and I had to resort to covering some of the botched mats with paper. The gallery wall does look nice though, so long as you don't inspect the mats too closely. Today, I have been making a poster for a creative competition :). I write on paper most days; I find handwritten thoughts flow better for me.